We did kid around, sort of, that we needed to have Brussel Sprouts, Belgian Waffles, and Belgian Frites while in Brussels. 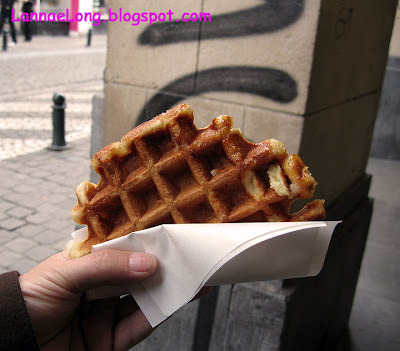 We did end up eating quite a few frites during our time in Brussels, and we did get a Belgian Waffle. We did not see any Brussel Sprouts, and I am pretty sure they were not in season yet. I also don't know if Brussel Sprouts are a thing in Brussels, or even if Brussel Sprouts are a common veggie in Brussels. For whatever it is worth, I like the taste and texture of Brussel Sprouts. 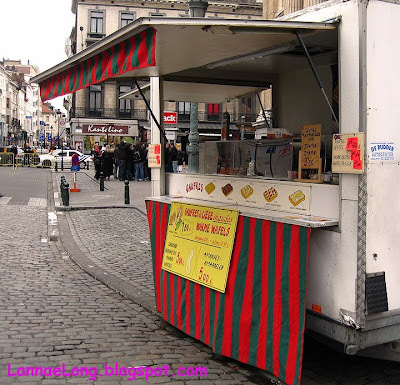 On Saturday and Sunday, Brussels downtown came alive with all the stores open, and other street vendors that were not there mid-week, including waffle stands. There were at least 4 waffle stands and a crepe shop along the few blocks it took us to walk to Central Station from our hotel. In Central Station, there is a waffle stand too. The waffle stands and shops just beckoned us to get one. It was exactly like you would think it would be - crunch on the outside, doughy and sweet. A good waffle. Next trip, we will try a chocolate covered waffle. 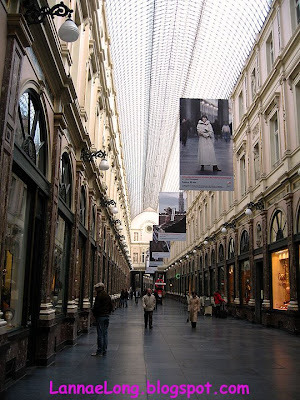 This shopping arcade in Brussels seems to be quite popular. There are such lovely shops inside, with window displays that just catch the eye. 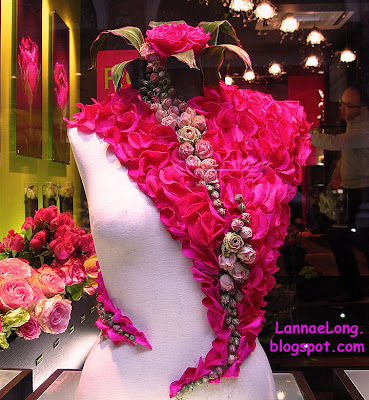 Inside the arcade was a florist withe he most beautiful rose petal display. I just could not take my eyes off of it. I was happy when I looked at the photo I took of the window because it the photo captured at least some of the beauty of the display. I think the display is stunning. We stopped outside of the bakery Paul and wanted to take a photo of the bakery to take home to our friend Paul. Up until the time we were trying to set up the photo shoot, everyone seemed to be passing by the shop. When we took out the cameras, to prep the shot, lots of people stopped to see what we would be photographing. 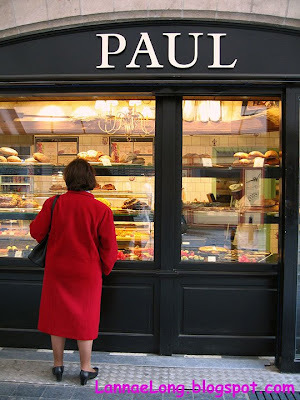 Confused at just seeing a normal bakery, people moved on except for this one woman in a red coat. She look and looked, took a quick look at us, and looked and looked inside even more. It was clear that we would have to take a photo of Paul with her in the photo. As we decided to move on, she decided to do the same. 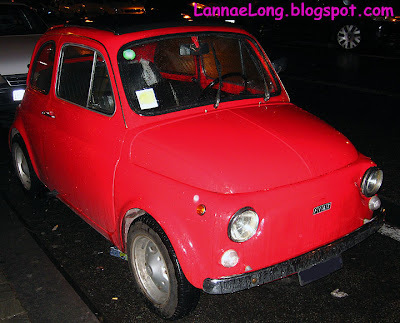 The fabulous part about renting a car in Belgium, and driving around France is that we got a little car. The agency gave us a Ford Fiesta. Given that many cars in this part of Europe are the size of the little Fiat, the Ford Fiesta was a mammoth car in comparison. I am also sure that the Ford Fiesta was a gas guzzler compared to the other smaller cars on the road. It was easy to get used to the small cars, and it was a pleasure to be able to stand on the street, and be able to see over the car and see street signs. It was a bit of a shock getting back to the Nashville airport parking lot where my small car looked and felt huge, yet was dwarfed by the gigantic gas guzzling trucks, SUVs, and luxury cars parked near us. We don't know what this wood sculpture is. Do you know? It caught my eye because I have never seen anything quite like it. 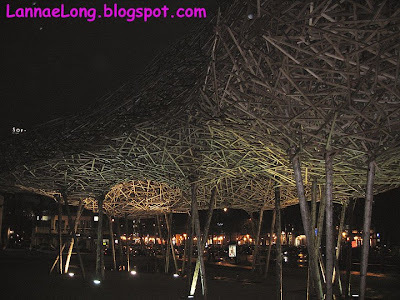 It is wood sticks stuck together in a dream space ship wavy shape, and held up by tree trunks. The floor is gravel with some halogen lights pointing upwards. It was really cool looking. I tried to take a bunch of photos of it, but since it was quite dark out when I was there, this is the only photo where you could see the sculpture fairly well. 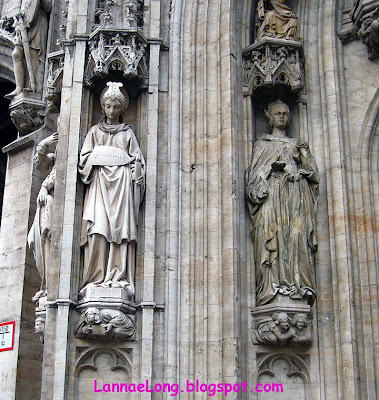 Saturday, our 2nd day in Brussels, we decided to see what we could see. The weather was cool, windy and overcast, and the rainy season was about to begin. We got lucky through, for the most part it did not rain on this day. 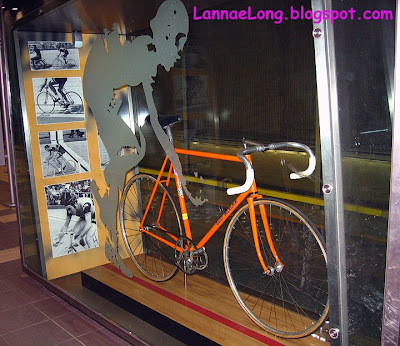 Our 1st stop was to go to see Eddy Merckx bicycle at the Eddy Merckx subway station. The Eddy Merckx station is located on the edge of Brussels with the Ikea and the Coca-Cola plant within walking distance. Eddy Merckx is the Belgian guy who who won the Tour de France 5 times and holds the distance record for a 1 hour bike ride. The bicycle shown above is the bike Eddy Merckx rode during his great land speed record. There are free audio tours of the E.U. Parliament at 10 am and 3 pm M-Th, and 10 am F when the E.U. is not in session. Just show up 15 - 30 minutes in advance of the tour time and wait in line. While we were walking around the garden close by to the E.U. Parliament, we saw a stray tortie cat. I hope there are enough voles and mice for the cat to eat in the garden. Outside the back door of the Hotel Arelquin is the famous tourist-trap, restaurant-row called Rue de Boucher. It is a pedestrian only cobblestone street that has only restaurants, and there seems to be 100 restaurants on this street. Each place has a hawker standing outside, he is in a suit or white dining staff coat. 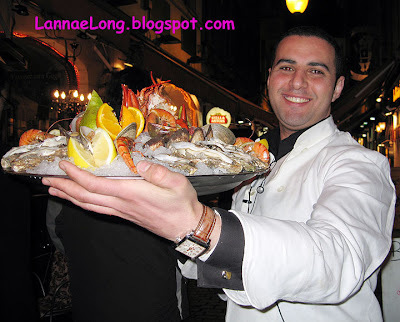 His job is to charm the women walking down Rue de Boucher, and convince the women and their party to dine at their restaurant. The hawking seems to begin in mid-afternoon to all hours of the night (to midnight at least). Each restaurant has yellow or white giant placards with red writing on it (many in English, thus tipping off anyone that this is a tourist area). The placards have a few reasonably priced a la carte items on them, for example soup 2 euros, or small salad 5 euros. The placards are definitely a "come on" and the reality is that most meals are around 50 euros (yikes!). But then again, this is a touristy area, so what would a touristy area be without the "come on" placards? 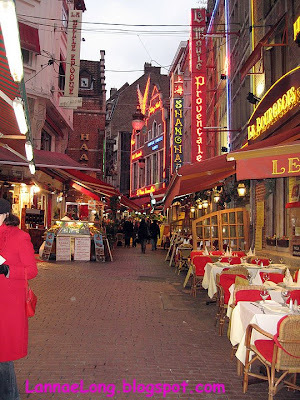 Rue de Boucher is a shortcut to Grand Place, a shopping arcade, and to the subway, so we ended up walking through this restaurant row multiple times. We only ate once on this street because it is not really our style to give into touristy restaurants because they usually are expensive, not a good value for the money, and many times the food isn't good. This time, we were only in country for less than 15 hours, we were quite tired and jet-lagged, and I just could not muster the mental energy to figure out an innovative and great place to eat for dinner, nor muster the physical energy to travel far from the hotel room. Also, we just had to give into the fact we were tourists, and sometimes tourist traps need to be on the to-do list. Exhausted, we walked out the back door of the Hotel Arlequin, and we were hit by the noise of the hawkers hawking their restaurants. It was dizzy-ing. Shaking our heads no, we walked around the few blocks trying to make a decision. I was tired and hungry, and we just had to go for one. 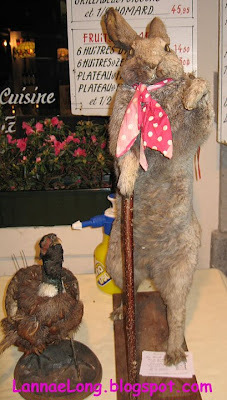 We went to Bruxelles Je T'aime, the Rue de Boucher restaurant that was directly outside the door of the Hotel Arlequin. The placards for this restaurant had a few menu items listed, and they were all less than 15 euros. When the waiter brought the real menu, there were a few starter items below 15 euros, but the rest of the menu items, which were a la carte, were all quite expensive ranging to 90 euros (about $150 for a dinner plate with March 2008 money conversion). At least we got the tourist trap dining off the plate early, and on day one, and we spent a small fortune. I totally dove into the touristy choice and got oysters and mussels for my dinner, while Matt got a beef stew served with steak fries. I do not get to eat oysters or mussels in Nashville because Tennessee is landlocked, and there really isn't anywhere to go to get raw oysters or mussels prepared well. I have to go coastal to get really good seafood, and that would be at least 400 mile (650 km) away from where I live. My starter of oysters were good. We watched "our hawker" make the plate for me, and it was a lovely plate. 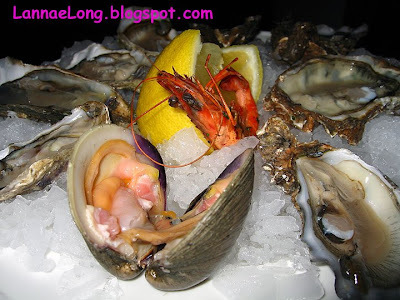 I ate the oysters with just a little lemon juice and enjoyed the slight mineral and fresh of the oysters. 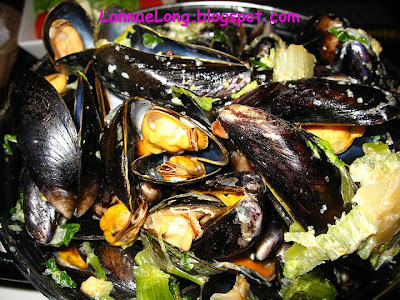 The mussels, I got as recommended in a leek, shallot and cream sauce. When the serving came out, it was in a huge bucket and overflowing. The bucket was the size of a medium sized Les Creuset Dutch oven. Those of you who have Les Creuset know how much food you can cook in a medium sized Dutch oven, and that was my dish. The volume could have easily fed 4 - 6 people comfortably, or me until I felt like I finished Thanksgiving. It may have been expensive for the bucket of mussels, but the flavor and texture of the mussels were perfect. The mussels were just freshly steamed, but not over done. My meal was good, and impossible to get in Nashville. The entire dining experience of the hawker and the people watching on Rue de Boucher is impossible to get in Nashville too. I am glad that we gave into the tourist experience for one day. The question I have is that all the meals we had in Brussels were huge. People keep saying that USA restaurant plates are huge (which they are), and that Europeans plates are so much smaller, like tasting plates or tapas plates (in tapas restaurants near me, the plates are big, not just 2 or 3 bits). Every single plate in both Brussels and 2 provinces in France were just as huge, or even more food than the USA. Can someone explain this to me? For the mussels dinner, do people generally order only one dish and share in restaurants in Brussels, or do they expect people to eat all that food all the time? We took our nap through the lunch 2 hours, and we got up to get some sunlight on our faces, and try to adjust to the 7 hour ahead time change. We also needed to find an ATM and get some euros to for our trip. Before leaving the USA, I did exchange money for 100 euros seed money to get us on the train and something to eat, but 100 euros wouldn't get us too far in this world city. Luckily, there is a great ATM at Central Station (on the subway side not the train side) that seems to take all networks, and seemed to be able to dispense at least 600 euro at a time. The ATM at the Brussels airport had a limit of 200 euro per transaction, and my bank charges $15 per foreign ATM transaction, so I really wanted to take money out once or twice and save on transaction fees, and the Brussels airport ATM did not dispense enough to make my transaction worthwhile. With euros in hand, we made our way a tourist junk shop, and found a walking map of Brussels with the Flemish street names. Ahhh, much better. We were ready to look around the town. 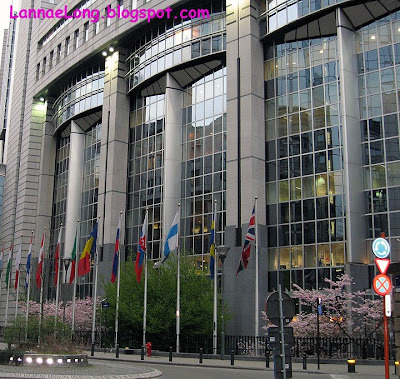 We went to Central Station to get our subway tickets form the manned ticket booth to go a few stops to Place Jourdan, and neighborhood in Brussels that looks quite livable, and near the European Union Parliament. The situation about getting subway tickets is that you need euro coins or a Europe ready "chip and pin" credit card, not the old fashioned swipe strip and sign system we have in the USA. I tried replacing my card with a Europe ready card, but no one I talked to in at the USA 800 number had a clue about what I was talking about. At anyrate, since we just landed, and had only a few coins and a bunch of paper euros, we needed a manned ticket booth to buy tickets for the subway. Luckily, we were staying near the station that seems to be quite well staffed, and we got our multi-ride tickets from the manned booth. We heard the subway train coming, so we took our tickets and ran to the subway train. What do we do with the tickets? There are no turn-stiles, there are no conductors on the subway, how does Brussels mass transit know we took a ride? It turns out, there seems to be the honor system. There is a little orange box on the wall near the subway stairs that validates the ride ticket. We did not see the orange box on our 1st ride, but every other ride we validated our ticket. We noticed some people validated, and some others did not. There were a couple outpost stations that we went to, and noticed people not validating any ticket and just getting on the subway. Can anyone tell me what the appropriate payment and validation protocol is for riding the Brussels subway? Are there people who get to ride for free? Are there people with monthly passes, who need not swipe their tickets? Are there free ride days or hours? Anyway, we got off at the subway stop closest to Place Jourdan, the home of Maison Antoine - the world's most famous Belgian Frites stand. 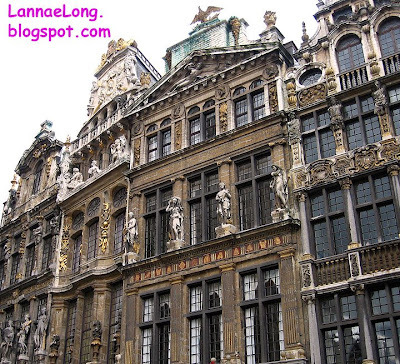 We had no idea what we were looking for because the Brussels guide book did not give an address, just that Maison Antoine was located in Place Jourdan, an area with about 7 feeder streets leading into this little triangular shaped place. We walked all up and down all the feeder streets for about a block, not seeing Maison Antoine. We criss-crossed the triangle multiple times, and then we stopped in the middle of the triangle next to a little boy statue to consult the map, and wonder if this famous frites place might have closed. To laugh at ourselves, as we were about to give up we looked up and there it was, The Maison Antoine. 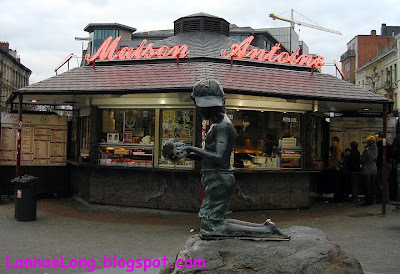 :) Maison Antoine was not a store front, rather it is a small stand that makes up the very center triangle of Place Jourdan. Belgian Frites are not French fries. Belgian Frites are shaped like large French Fries, flash fried and then set up on the shelf until someone orders frites, and then the flash fried Frites are then deep fried again until done. They dump the twice fried frites in a big steel bowl, and gently toss with a little salt. This makes for a really delightful crunchy outside, and perfectly done inside. The finished frites are wrapped in a cone shaped paper for easy handling. The Belgian Frites at Maison Antoine are served with a sauce, mayonnaise is standard, but Maison Antoine offers dozens of other types of sauces (many are mayo based). Matt opted for the traditional mayonnaise, and I opted for the tartare maison which had herbs and garlic in it. For 1.90 euros, a huge paper cone of frites could be yours! There are so many frites per cone, I would suggest sharing a cone. These frites are so good! 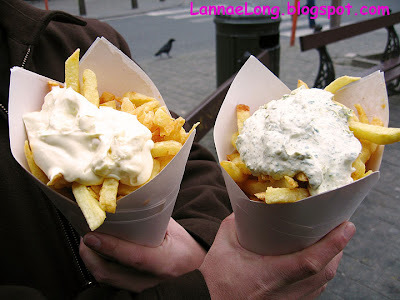 I enjoyed these frites so much that we went back again to eat these yummies! We were in Brussels for about 2 hours when the Hotel Arlequin frontdesk manager told us that our room was not ready, but we could go eat breakfast. I believe he suggested that we dine on the 7th floor of the of the hotel, but being so tired we missed what he was saying. 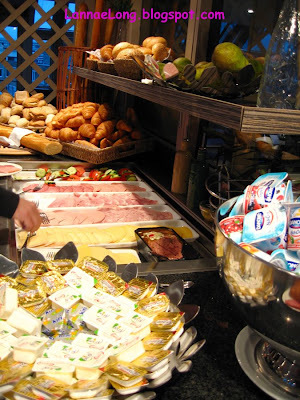 So we opted to leave our luggage in the luggage room at the hotel, and go find some breakfast in lovely Brussels. Since it was so early, before 9 a.m., the streets of central Brussels were so quiet. If you have ever been to Soho Manhattan at 8 a.m. window shopping, you know that same quiet before the shops and lunch spots have a chance to open. We really enjoyed our sleepy walk through Brussels at this time, it was almost like Brussels was completely ours to take in. We had no idea that we would not ever have this quiet Brussels to ourselves again. On the plane, we were given a breakfast snack box of a danish, bread, and some other empty carb thing. The danish was actually quite bad in my opinion, it made my stomach turn, and I did not eat any of it. At this point, I had not really eaten much for the past 14 hours, so I was rather hungry. 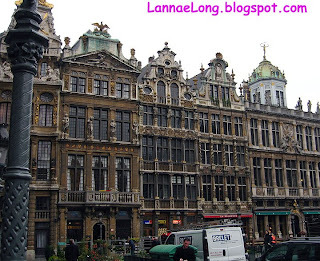 We wondered into Grand Place Square which is really quite amazing. The architecture is breath-taking, and the artistry of each building should be drunk in by everyone who can see. These beautiful buildings are completely the opposite of the low bid federal buildings of Nashville. We spent a lot time just looking and looking, and getting hungrier and hungrier, and then we saw one tavern open with people sitting in there drinking coffee. Sign me, I am in. The tavern is called La Brouette, and it has a red awning on the square. The decor gave a feel of an old world tavern, there was a fire going in the fire place, and the waiters and manager all were quite professional and spoke multiple languages. I tried to order our breakfast menu in French, and the manager kindly responded in English, to which I responded in both English and French, Thank You et Merci. He brought to us fresh squeezed juice, really strong cafe creme, lovely croissants and breads, butter, jams, cheeses and ham. We were so happy to have real food make with Belgium quality. 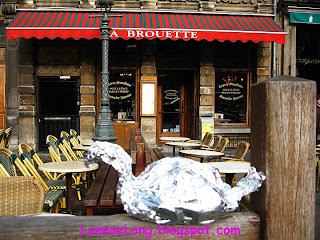 Since La Brouette provide way too much food for us, I asked for a to-go bag and the manager was so kind to wrap up the extra croissants, bread, butter and jam for us in a foil shaped as a duck or maybe a swan. I was thrilled because we were going to travel down into the south of Burgundy on Sunday, and the leftover croissants were going to make a great road snack. This breakfast treat really hit the spot. We left this tavern to see what we could see, and waste a little more time until about 10:30 a.m. to see if we could check into our room. During our walk, we kept on seeing these signs for the Keno game. Since we don't know Flemish, we have no idea what the sign says. 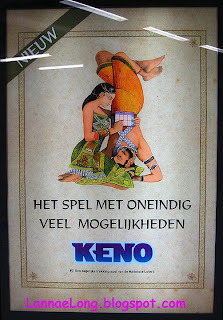 We can think it says something like, there are many ways to play Keno like the Kama Sutra. We did not play Keno, so we are not sure. The hotel staff at the Hotel Arlequin were so gracious and helpful, and the let us check in 5 hours early at no extra cost! We did need a nap before taking in more the city. So off to la-la land for a couple hours before fulfilling our list of things we wanted to see and do. 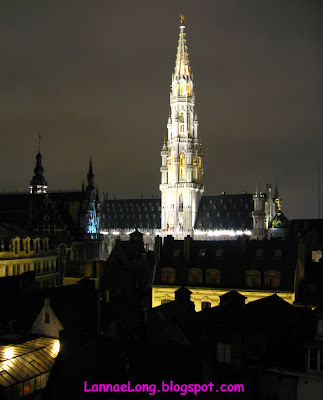 We got into Brussels on a Friday morning at 6:30 a.m. and a bit blurry eyed. We get through border patrol, get our visitor visa stamps in our passports, pick up our luggage and went looking for the express train to Central Station, Brussels. All of the written directions I had printed out were in French. 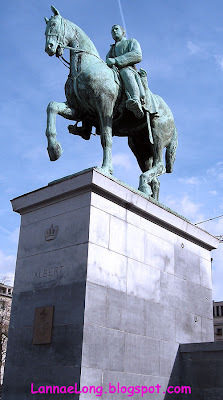 2 decades ago in my Boston high school French class, my German origin teacher said that Brussels is a fantastic city that is based in the French language and it is very easy to get around Brussels knowing French. I was under the impression that Brussels was a French speaking city. To my surprise, all of the train and street signs were in Flemish. None of my directions (in French) matched up with any train directions (in Flemish), so we were definitely directionally challenged at this point. We had two choices at the airport train station, platform 1 or platform 2, but which one? Did we choose wisely? Yes, we got on the express train to Central Station, Brussels on platform 2. We got off at Central Station, still a blurry eyed and exhausted after flying overnight and the time change. I pull out the French written instructions to the hotel we were staying at. We look up and there were the big Flemish street signs. None of the Flemish street names resemble any of the French street names (ex. Fourche and Greepstraat, or Herbe and Grasmarktstraat). Before we left, Matt did take time to look at the Google Earth satellite map of the few blocks were we needed to go. He lead us, totally by feel through the cobblestone streets with rolling luggage to a tiny street that looks like an alley way, and TA DA, our hotel and it was about 8 a.m.
We opted for this hotel after looking at various travel guides like Let's Go, Lonely Planet and Tripadvisor.com. Let's Go recommended this great hotel so highly, and all the Tripadvisor posts raved about this place, so booked we did. It was only about 63 euros per night. There were no cons to this hotel for us. The pros about the hotel are the spacious and comfortable lobby, full bar in the lobby, the well versed in mulitple languages hotel employees, short strolls to Grand Place and Central Station, WiFi, and an internet ready computer for guests (5 euros per use). The rooms were amazing as well. I felt like the room was quite roomy for this ancient city, the linens were crisp and clean, the marble bathrooms have luxurious showers, and the view from our 6th floor room was breath-taking. The breakfast is the best breakfast I have ever seen anywhere. There were wonderfully made scrambled eggs, boiled eggs, croissants, baguettes, fresh fruits, meats, cheeses, yogurt, cereal, milk, juice, tea, coffee, hot chocolate, tomato cucumber salad, and all the real butter and jams you want. I know I am leaving something out. This was the best value for our buck for sure for location, comfort, luxury and breakfast. Pardon, I will be taking a week break to taste Belgian frites and French pain (bread, not pain in the neck pain). Until then, bon apetite! I have been embracing the fabulous East Asian food I have been told about recently. At my friend's birthday party at the Tofu House, other birthday guests were talking about Seoul Garden as another exceptional Korean restaurant in town. I had heard just scant information about Seoul Garden before dining at Tofu House, and I had scant information after leaving Tofu House. The difference was a resounding endorsement for Seoul Garden by everyone dining near me. So, when the next opportunity presented itself for a dinner out, we went off to find Seoul Garden. We headed south on Nolensville Rd, saw the Southern Hills Medical Center and turned right onto Edmonson Pike, and there it was, Seoul Garden in a brand new strip mall. There was plenty of parking, and we walked in. 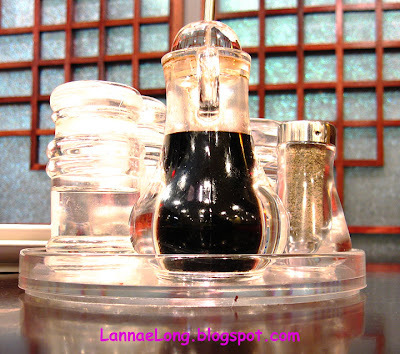 Because the space is less than 1 year old (8 months, Seoul Garden opened in July 2007), the restaurant felt clean and beautiful. There are 2 sides of the restaurant - the regular menu side, and the grill side. The regular menu side offers foods that are prepared in the kitchen, and is standard restaurant attendance as with most any restaurant in the USA. We opted for the grill side. To my delight, the grill is truly a wood grill built into the center of the table. The waiter brings out a hot pile of charcoal for the center of the table, and that is where meats are cooked by the diner. I love playing and doing stuff to my food, so this was a great evening for me. I also love the charcoal wood flavor, so this was a double bonus for me. It has been winter here, so we have not used our wood grill (too cold to be outside tending the thing). For people who are used to communal food (not Russian Service), who like to play with their food, eat meat and think cooking is a great activity, I highly suggest Seoul Garden for a dinner party of 2 -6 people. It was really fun! As I am learning (since I know little about Korean food), the side dishes are a part of the dining experience. I love this too. I love the cute little dishes of various tasty treats. 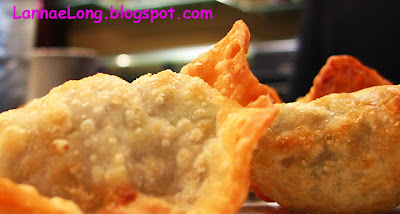 It is like dim sum or tapas. 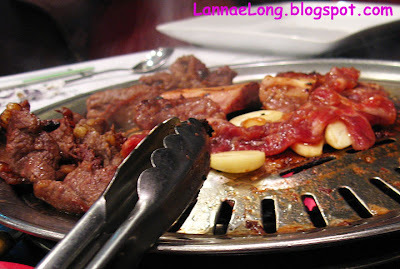 The sides we had at Seoul Garden were those little anchovy dried fish (yum for me! Matt doesn't like 'em, so more for me), kim chi English cucumber pickles, kim chi shredded daikon, kim chi cabbage, savory bean paste, and three others which I can't remember. It is just so fun for me to take a little nibble here, and then another nibble there. We both ordered beef, so we got short ribs and sirloin. Both seemed to be marinated in the same sweet and savory soy based sauce, which I liked. I opted for the beef, rather than the chicken or pork because if I did not cook the beef to death, it would be ok. I just don't care for undercooked chicken or pork, and I was afraid I would not cook the chicken or pork correctly. There is such a fine line between cooked through and over cooked, dry, burnt and stringy. Beef is much more forgiving when it comes to grilling meat. The real wood charcoal at the table is amazing to me, fun, and tasty. Real wood charcoal lends such a nice flavor and aroma to the meats. The Korean place I went to 10 years ago (they are not closed) did not have charcoal, they just had a hot griddle built into the table, and the griddle just could not get deliver the BTUs, or wood smoked flavor that Seoul Gardens real wood charcoal does. Trying to cook a steak on a griddle that doesn't deliver high BTUs, well, it is not my preferred method and I think it ruins beef. 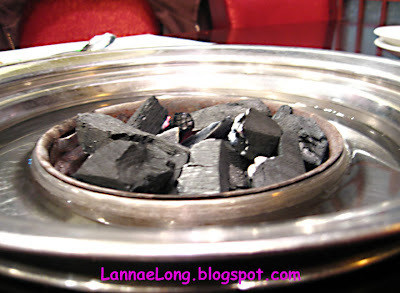 At Seoul Garden, the charcoal delivers, and is just delicious!